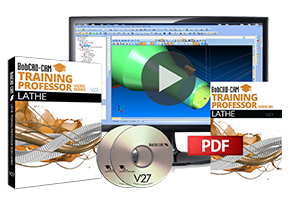 The v27 Lathe CAD-CAM Training Professor Book & Video Series is a comprehensive training package geared to help you master your Lathe CNC programming software at your own pace. The training lessons cover all machining operations for 2 Axis Lathe, machining wizards, CAM cutting condition set up, tools, materials and much more. DESIGN parts from start to finish. Use TOOLPATH PROGRAMMING strategies to speed part programming. SIMULATION enables you to avoid costly mistakes. The detailed digital workbook guides you step-by-step through each lesson and includes a library of pre-made CAD files that correspond to the workbook tutorials. Lessons are self-contained and portable. Learn what you want, when you want, and where you want – in your office, in your shop, in your home, or on the road. This new V27 training series is like having a personal training professor in a box, teaching you everything you need to know about the v27 BobCAD-CAM Lathe software from A to Z!